Sterling is one of the top schools in the Greenville. County School District. Sterling School serves 4K to 5th Grade students from the school’s surrounding neighborhoods. 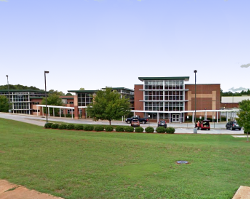 Sterling School is also the school of choice for highly gifted students from all over Greenville County provided the student qualifies for the program. The program is open for highly gifted students from Grade 3 to 8. The two programs ( Sterling elementary and Charles Townes Center for the gifted) take learning to its highest level. The school also offers plenty of opportunities for students to contribute to the community through interactive relationships. Facilities at Sterling School include 3 science labs, Full-size gym, Wi-Fi throughout the facility, 1 studio, Track Tennis courts, Technology Lab, Outdoor learning stations and Amphitheater, SC Garden, Japanese Garden, Sliding Rock Green Spur of Swamp Rabbit Trail. Currently, Sterling School has a perfect rating of 10 on GreatSchools.org. Check out our featured neighborhoods and subdivisions around Sterling School in Greenville, SC. Each one of this community is unique in itself for various reasons. They also vary in price ranges, home features, and community amenities. Below is the list to help you get started in finding a home near Sterling School. If you have any questions about any of these neighborhoods don’t hesitate to contact us.